The Europe of Freedom and Direct Democracy group, of which UKIP is the largest part, collapsed last week after the departure of a Latvian MEP left it with representatives from only six EU member states. It included MEPs from Italian populist Beppe Grillo’s Five Star Movement, two members of the fascist Sweden Democrats party, Joëlle Bergeron who claims to have broken with the French fascist Front National party, and an MP each from the Czech Republic and Lithuania. European Parliament groups need to cover seven member states to gain official status – and the huge levels of funding this brings, with UKIP alone estimated to have £1m a year at stake. But in a statement posted today, the EFDD claimed “normal transmission is resumed” after it hurriedly recruited Robert Jarosław Iwaszkievicz, one of four MEPs from the far right Congress of the New Right (Kongres Nowej Prawicy, or KNP). 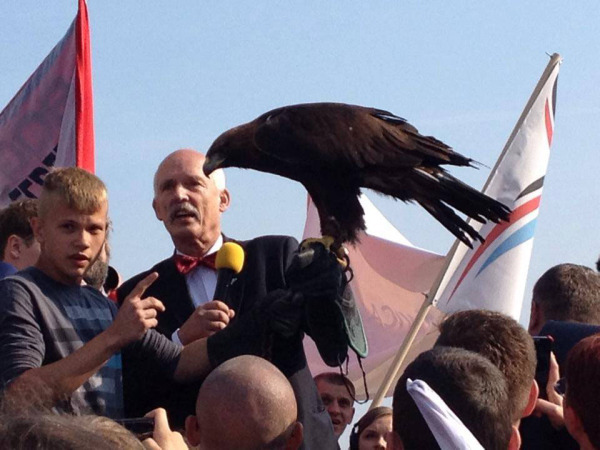 The KNP is led and heavily dominated by its leader Janusz Korwin-Mikke, also an MEP, whose name appears emblazoned across the top of the party’s website alongside its official name. Show me even one sentence of Hitler, that will attest to the fact that he knew about the extermination of the Jews. You will not find [it]. If Hitler was for lower taxes, and now they are bigger – what is wrong with the fact that he wants to say it? The KNP is in economic terms ultra-neoliberal, supporting the abolition of income tax and the drastic reduction of the public sector to a mere skeleton. It is deeply socially conservative, opposing rights such as gay marriage. We noted last week that the collapse of the EFDD group could prompt a realignment among the parties of Europe’s chronically unstable far right. Following the May elections, an unsavoury array of racist populist and fascist parties has increased its numbers in the European Parliament. Some of the assorted far right MEPs are in the EFDD while others have been admitted to European Conservatives and Reformists group, where they sit alongside Britain’s Tories. Others, like the KNP, have up to now remained unattached. Now one of the four KNP MEPs has climbed into bed with UKIP, something Farage and his cohorts in the EFDD hope will allow them to reconstitute their group – and turn the money tap back on. The alliance of racist populist and fascist parties grouped around France’s Front National leader Marine Le Pen and Dutch PVV leader Geert Wilders has been waiting in the wings after failing to gain MEPs from enough states to form a group itself – it will have to keep waiting.